Would you like to give your students an opportunity to experience the simple joy of poetry? If so, here’s your chance! Every year during National Poetry Month, one day is designated Poem in Your Pocket Day. It is a great way to celebrate and share poetry! This year it is April 30th. Of course, you can celebrate a local version of Poem in Your Pocket Day on any day of the year! All day long, poems will be unfolded and shared in bookstores, parks, schools, cafes, and libraries. You and your students can be a part of it! It's simple! 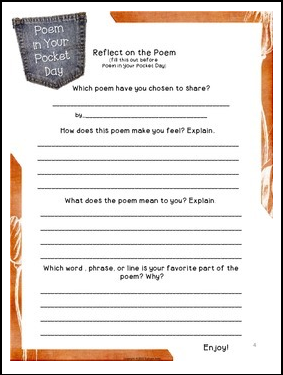 Students will select a poem they love, carry the poem in their pocket, and share it with everyone they meet! This freebie includes a student information sheet, two reflections sheets, a poster, and creative suggestions for other ways to share poetry. Poet James Dickey said this about poetry: "When you really feel it, a new part of you happens, or an old part is renewed, with surprise and delight at being what it is."